Shop Christopher and Banks Utica Corners today for Style, Value, and Service that will help you look fabulous and feel amazing every day during the warmer months. 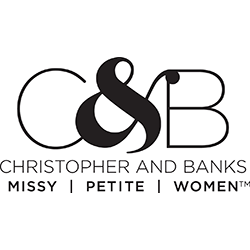 As a specialty women’s retailer for those who value quality, affordable stylish apparel, accessories and exceptional service, Christopher & Banks offers amazing fashion for Plus Size, Petite, and Missy sizes. Our label is designed exclusively to be the “perfect fit” for women of all ages and all sizes since 1956. We guarantee that when you visit our women’s clothing store located in Utica Corners in Utica, MI our store sales associate will help you build outfits to suit your individuality. We hope to see you soon.